Good Vibes Festival lived up to its namesake last year as 13,000 revelers gathered at The Ranch at Gohtong Jaya in Genting Highlands for its highly anticipated return to the scenic location. And we can once again rejoice, as the organisers Future Sound Asia have announced the anticipated lineup for Malaysia’s favourite mixed-genre festival’s return to on July 21 and 22. 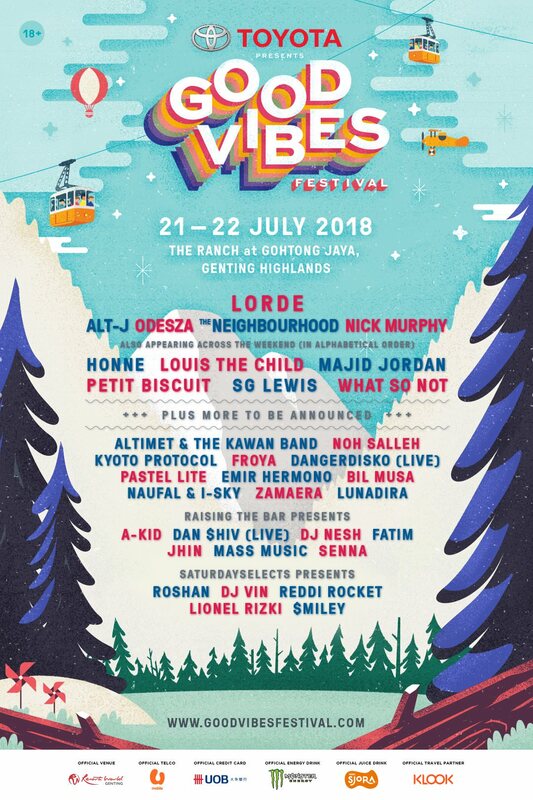 This year, the line up includes New Zealand’s indie star Lorde, British indie rockers alt-J, American pop band The Neighbourhood, Australian singer and songwriter, Nick Murphy fka Chet Faker, electronic music duo ODESZA, Drake protégés Majid Jordan, British-born multi-instrumentalist and producer SG Lewis. On the local front, the organisers have included heavy hitters Altimet & The Kawan Band, Noh Salleh, Kyoto Protocol, Pastel Lite, Zamaera, Froya, Bil Musa, Emir Hermono, LUNADIRA, SaturdaySelects, Raising The Bar, Naufal & I-Sky, and Dangerdisko (live). More acts to be announced soon. Early-bird tickets will be available for purchase on 21 April via Good Vibes Festival’s website. Check out the festival’s 2017 aftermovie below.